Mikael Takacs is a marbler based in Sweden. He uses pipettes to distribute acrylic paint across the canvas to create his subjects, which he then distorts by dragging the paint around using various tools, such as sticks and combs. He combines the classic abstract expression of marbling with concrete figures. This results in intricate razorsharp patterns swirling across the canvas as you look at it up close, which then takes the form of a portrait as you take a few steps back. Even though the patterns in themselves are very sharp they can make the figure look blurry or fuzzy, which can have a somewhat anonymyzing effect. This can make it both easier and harder to connect with them. It’s harder in the sense that you can’t really see who it is, or maybe even what it is. It may be easier to connect with them for basically the same reason, as you can project so much of your own thoughts onto someone you can just barely see. The vivid and abstract is in contrast to the vague and figurative. Variations of this technique has been around for hundreds of years, but in spite of that, his pieces are often mistaken for digital art. 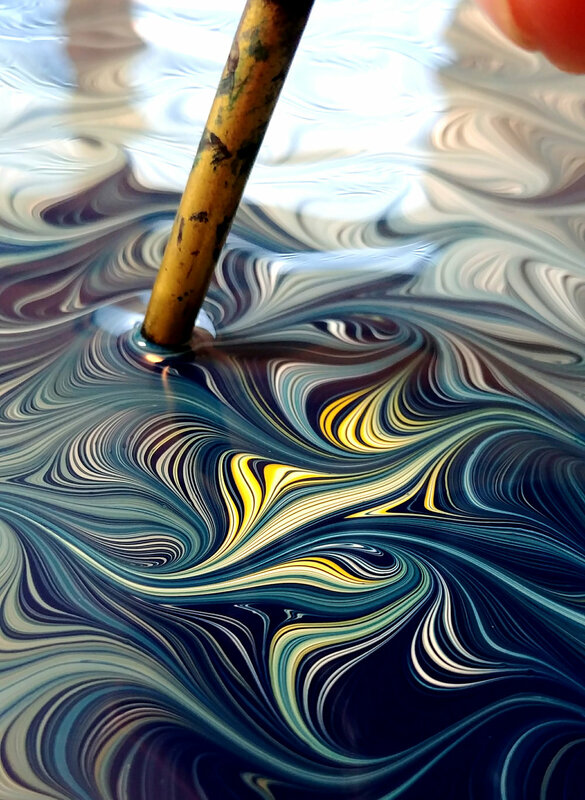 Marbling is said to originate in the 12th century Japan as "Suminagashi", and centuries later made it's way to Europe through the Ottoman Empire and the "Ebru" method. 2016/12 Corey Helford Gallery, Los Angeles. 2019/01 "Auksjunsutstilling", Galleri Ramfjord, Oslo. 2018/12 "5th Art Collector Starter Kit", Corey Helford Gallery, Los Angeles. 2018/08 "20 års jubileumsutstilling", Galleri Ramfjord, Oslo. 2018/08 "Delusional", Jonathan LeVine Projects, Jersey City. 2018/05 "20x20x20", Vertical Gallery, Chicago. 2018/03 "Hello My Dear", Heliumcowboy Artspace, Hamburg. 2018/03 "GW remix III" Galerie Wolfsen, Aalborg. 2018/02 "Visuel & Venner", Kattesundet 10, Copenhagen. 2018/02 "First" Heliumcowboy Artspace, Hamburg. 2018/01 "Auksjunsutstilling", Galleri Ramfjord, Oslo. 2017/12 "Vintersalong", Galleri Backlund, Gothenburg. 2017/11 "Juleutstilling", Galleri Ramfjord, Oslo. 2017/09 25th anniversary show "Cirkus Wolfsen", Galerie Wolfsen, Aalborg. 2017/09 "AEA 2017 Showcase", Arch Enemy Arts, Philadelphia. 2017/07 "15th Anniversary exhibition", Heliumcowboy Artspace, Hamburg. 2017/06 "Auksjonsutstilling", Galleri Ramfjord, Oslo. 2017/04 "4th Art Collector Starter Kit", Corey Helford Gallery, Los Angeles. 2017/03 "Trumpomania", Salomon Arts Gallery, New York. 2017/01 "Sensory Overload", Corey Helford Gallery, Los Angeles. 2016/09 "Urban Dawn II", Factory Lofts, Beirut. 2016/08 "MUD", Galerie Wolfsen, Aalborg. 2016/08 "18th Anniversary show", Galleri Ramfjord, Oslo. 2016/08 "10th Anniversary show", Corey Helford Gallery, Los Angeles. 2016/06 Auksjonsutstilling, Galleri Ramfjord, Oslo. 2016/03 "4th Annual 12X12 Group Show", Gauntlet Gallery, San Francisco. 2016/02 "Below the surface", Corey Helford Gallery, Los Angeles. 2016/01 "Asymmetrical Diptych Party", Corey Helford Gallery, Los Angeles. 2016/01 "Puls'16", Galerie Wolfsen, Aalborg. 2019/02 Art Herning, with Galerie Wolfsen, Herning. 2018/10 Affordable Art Fair Stockholm, with Galleri Ramfjord, Stockholm. 2018/09 North Kunstmesse, with Galerie Wolfsen, Aalborg. 2018/01 Art Herning, with Galerie Wolfsen, Herning. 2017/12 Scope Miami, with Galerie Wolfsen, Miami. 2017/09 Kunstmesse Odense, with Galerie Wolfsen, Odense. 2017/03 North kunstmesse, with Galerie Wolfsen, Aalborg. 2017/01 Art Herning, with Galerie Wolfsen, Herning. 2016/08 Art Copenhagen, with Galerie Wolfsen, Copenhagen. 2016/06 Scope Basel, with Galerie Wolfsen, Basel. 2016/04 North Kunstmesse, with Galerie Wolfsen, Aalborg. 2016/01 Art Herning, with Galerie Wolfsen, Herning. 2013/10 Art Cologne, with Strychnin Gallery, Cologne.